A new study suggests that the AAP's stance on room-sharing might have its drawbacks—but if you're a new parent, which school of thought should you follow? Last year, the American Academy of Pediatrics came out with a recommendation that surprised a lot of people: They stated that babies should sleep in the same room as their parents until they are at least six months—but preferably, until their first birthday. The announcement made more than a few parents worried about their own well being. 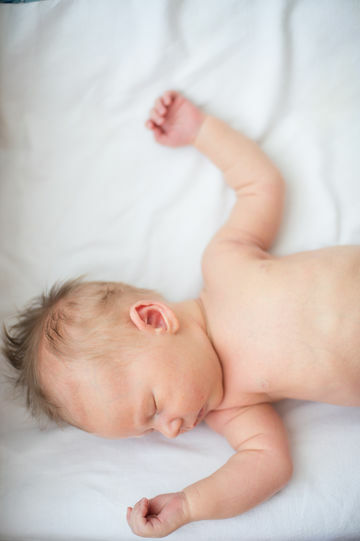 New parents have always been short on sleep, and many feared that sleeping in the same room as an infant for a full year would make it even more difficult to get enough shut eye. This fear may be right on the money: Parents and children alike seem to get less sleep when room-sharing is involved, at least if the newest research is any indication. A study published in Pediatrics challenges the AAP stance: Researchers from Penn State College of Medicine looked at previously collected data from 279 mothers and their babies who reported patterns in questionnaires. According to their findings, babies who slept in their own rooms at four months were sleeping in stretches 45 minutes longer on average than their room-sharing counterparts. By nine months, babies sleeping away from parents slept in stretches an hour and forty minutes longer than those who shared bedrooms with their parents. But let's be honest here: What parent would compromise his or her child's safety in the name of more sleep? And if the AAP's recommendation is the one that can reduce the risk of sudden infant death syndrome...well, that's the clear winner, right? Well, it may not be so simple: In addition to observing the amount of sleep participants were getting, the researchers also learned a few things about other sleep behaviors. Members of their sample actually appeared to uphold safer sleep practices when babies were kept in their own rooms. Babies sleeping in their parents' rooms were seemingly more likely to bed-share (which the AAP cautions against) or sleep with unsafe items in their cribs. Of course, this is just based on the study's sample and can't paint a full picture of each room-sharing family's situation. The AAP published a reaction to the Penn State study's finding, and even that commentary hints at the idea that this issue isn't black and white—and that there's more research needed on this complicated issue. So what's the right choice—room sharing or a separate room? Maybe the point of all this isn't to pit one opinion against the other. Maybe it's simply evidence that parents need to weigh multiple factors, loop in their doctors and carefully assess their own situations before deciding which sleep setup works best for their family. Daniel Ganjian, MD, a board-certified pediatrician at Providence Saint John’s Health Center in Santa Monica, agrees with the idea that each family’s ideal sleep setup is going to look a bit different. Dr. Ganjian—who also happens to be the father of a six-month-old—weighed in on the findings. Regardless of your situation, you should bring up any questions you may have with your child's doctor. You want to do everything in your power to keep your baby safe, but sleep quality is also important for both you and your baby. In short? This seems like one of those issues that will always be a little bit controversial, and we don't imagine there will ever be a time when opposing opinions about infant sleep don't exist. We'll wait for more research on this topic, but for now, we'd urge you to discuss your options with your doctor, who can better evaluate your individual situation.